This entry was posted in How historians work, Introduction to Australian History, Sport and tagged Aboriginal, Aussie Rules, Australia, Football, History by perkinsy. Bookmark the permalink. Thanks Yvonne. This confrontation of racism also needs to be led by Prime Minister Tony Abbott and leader of the Opposition, Bill Shorten. Yes, this is a society-wide issue, not just an issue of one sporting code. The NSW historians said “we well know the impacts of past social attitudes and government policies – impacts that last across generations, often with terrible ongoing results. But …we also believe we have a role to comment on the context of issues that have plagued, and continue to plague, Australian history and society. The recent racist actions and words of some in the debate around Adam Goodes have left many of our members appalled and distressed”. I normally have an optimistic view of human development over the centuries; we humans can and do learn to be increasingly democratic, less racist, less anti-Semitic, less murderous. 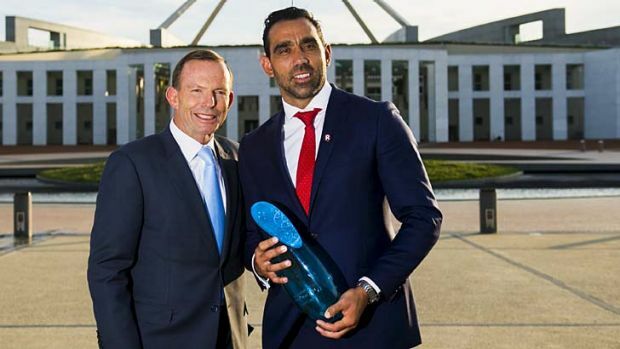 The Goodes story has shown how we can flip back to colonial racism and violence… in a heartbeat 😦 So I agree that this is well beyond one sport, even if it is the most important sport in the country. Both at school and in my family I was expected to mix with people of all backgrounds as I was growing up. I am astounded, ashamed, embarrassed and depressed at how we have gone backwards in the last couple of decades. It demonstrates how embedded racism is in our culture and the importance of every one of us consciously monitoring and correcting ourselves, and of having the humility to admit that we did the wrong thing. I agree with you Helen. We can regress in a heartbeat. I don’t subscribe to the idea that racism is in our DNA. It is learned. As we learn it, we can unlearn it. That does not mean it is easy. Even those of us who do try every day to treat people equally can slip up. Sometimes we don’t realise it. Often it is only when we mix with people of different backgrounds that we realise our attitudes are not what they should be as a result of someone else pointing it out. We can only improve if we accept that we are imperfect and abandon the defensiveness that our sensitive egos are prone to erect.